With the scope of influencer marketing ever growing, Sideqik is excited to announce we now support Tumblr analytics. Our Tumblr support fills a hole our customers were seeing in the market and helps brands have a more holistic view of their influencer marketing program. 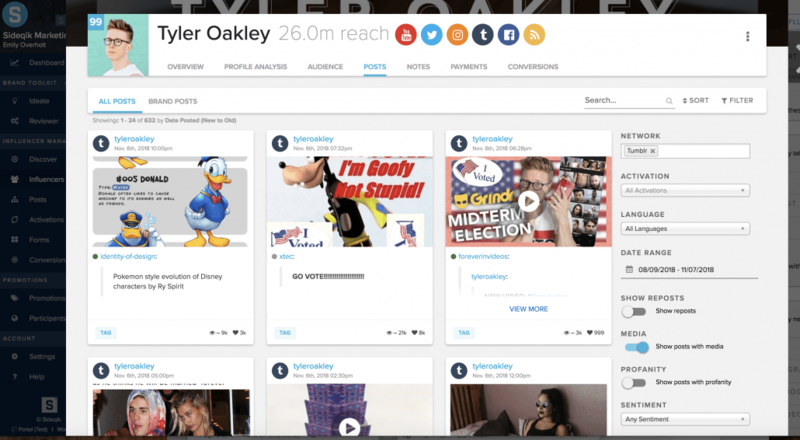 You can now use Sideqik to track your influencers on Tumblr, work with them on campaigns, measure engagement on their posts, and discover new Tumblr influencers. Our proprietary analytics technology is fully integrated with Tumblr: track ROI, measure engagement, find Tumblr users relevant to your brand, filter Tumblr influencers by their location, interests, size of their audience, and more. You can even play video and audio from Tumblr posts from inside Sideqik. In short, all the great analytics of Sideqik work seamlessly with Tumblr. Whether you’re discovering a popular blog or measuring how well your ongoing activation is performing, we are with you the whole way. Starting as a microblogging site in 2007, Tumblr now has over 417.1 million blogs and more than 161.3 billion posts in total. Recent data shows that Tumblr has 555 million monthly visitors. Tumblr’s strength lies in the site’s passionate groups. Be it television shows, book series, or other content, tags through Tumblr bring millions of people together to celebrate who they love. This is a huge opportunity for brands looking to find their biggest fans. Tumblr also opens the door for monetizing memes. The platform is rife with witticisms and catchy gifs, with popular accounts bringing in huge engagement for the right turn of phrase. We’re excited to see how our customers leverage this different format of sharing for marketing success. With Tumblr, as in all things, Sideqik is taking a broad look at influencer marketing. We’re not curating a pool of influencers. We’re finding influencers who talk about things that matter to you. We are actively looking for new blogs that may be of interest to your brand. This is an exciting time for influencer marketing, and branching out into new networks is just one way we’re helping move toward the future.